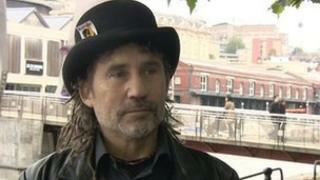 A candidate standing in the Bristol mayoral election said he was not being taken seriously after he was denied an invite to take part in hustings. Independent Rich Fisher said he was not asked to a Sustrans event as well as a another debate held last week. He said he had not been told about many debates and only found out about the Sustrans meeting from a third party. Matt Hemsley, from Sustrans, said it would have been difficult to have a debate with all 15 candidates. Mr Fisher said he was planning to take part in four or five debates over the next week. He added he particularly wanted to take part in the debate organised by Sustrans, a sustainable transport charity, because he had ideas about cycling and the transport network. Instead, he attended as a member of the audience and asked one question. Mr Hemsley said: "If we've only got an hour-and-a-half it would leave a limited number of questions and opportunities for each candidate to speak and to get their point across. "We're not here to deny anyone a voice, we'll be making sure that everyone in the room knows that there are nine other candidates standing and they can go and find out their views but it's obviously a really difficult decision." Mr Hemsley said candidates were chosen by previous election results in Bristol and the profile of different candidates. But Mr Fisher disagreed, saying as this was the first time that an election for a Bristol mayor had taken place, previous election results should not count. "I'm an Independent, I have no political ties, no affiliations, and my voice is as equally valid as other people to be heard," he said. "Based on the way things are going at the moment, it's going to fall in favour for the main political parties. "There shouldn't be any political ties and really only Independents should be considered for this election - let's get away from party politics."